THURSDAY, MAY 9TH from 7:00pm – 12:00am Come enjoy your favorite hit music from the 90s, early 2000’s & much, much more! 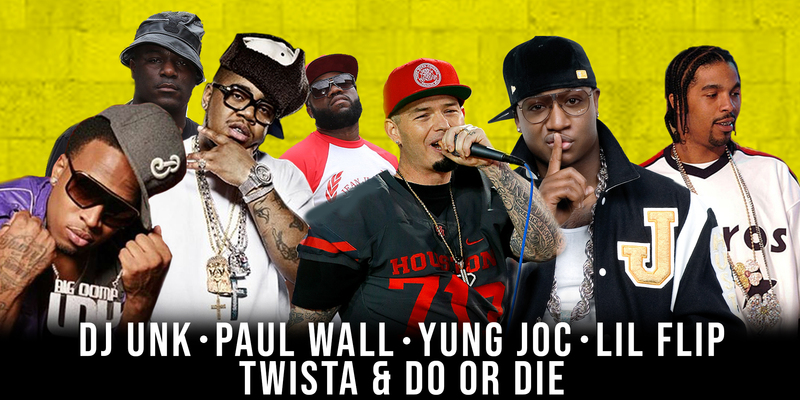 Come see Yung Joc, Paul Wall, Twista & Do or Die, Lil Flip and DJ Unk performing live on the Peter Franklin Jewelers stage! Join us downtown at Headwaters Park on May 10th from 7pm – 12am for Throwback Thursday, the 1st night of the Fort Wayne Music Festival powered by Sweetwater and co-sponsored by Parkview, Ash Brokerage and DreamMakers Automotive. Advance tickets are only $15! Enjoy your favorite hit music from the 90s, early 2000s & much, much more! Come see Yung Joc, Paul Wall, Twista & Do or Die, Lil Flip, and DJ Unk with Kenny Redd & DJ RC performing live! VIP TICKETs include early entry to the venue, front row VIP access, use of the VIP restrooms, access to the tables and chairs exclusive to the VIP area, as the rest of the venue will be standing room only. Throwback Thursday 2019 is powered by Sweetwater, and made possible by Chuck & LIsa Surack, Ash Brokerage, DreamMakers Automotive, and Key Exteriors. I want to come to the concert but I have class in the Am / or before it starts… What do I do? You are able to come to the concert even if you are not there when you open (unless sold out). Concert portion will start about 1-2 hours after doors open. If you have the following class AM, Do not worry, the concert will end at 12 am. Feel free to stay or leave after performances. The name on the registration / ticket does not match the attendee. Is that okay? Ticket does NOT have to match name on ticket attendee if tickets were PURCHASED ! If you have received any kind of discounted or FREE ticket . NAME MUST MATCH ID AT THE DOOR! We have the right to deny entry.